With Memorial Day on Monday, I decided to post a recipe you might enjoy making for your picnic. 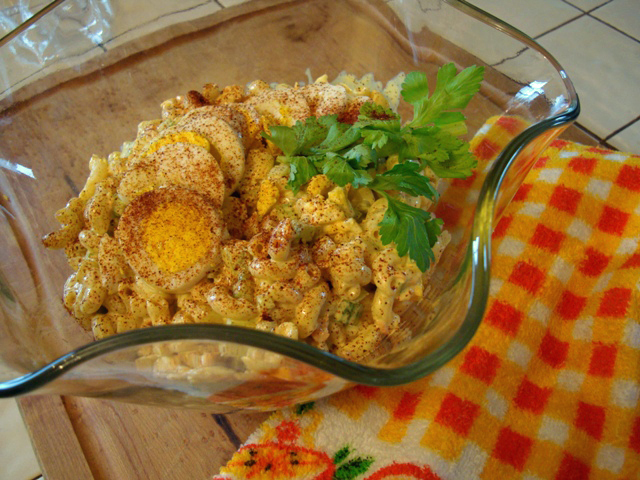 One of the things I can remember my grandma always making for picnics was macaroni salad. As is the case with most recipes passed through the family, there is not an actual written down recipe. I’ve attempted to put together some ingredients for you, though. Her salad is a little different than you buy in the store because it has mustard which gives it a spicier flavor and a light yellow color. I also enjoy this salad more because I know that it is homemade and not filled with a bunch of preservatives. 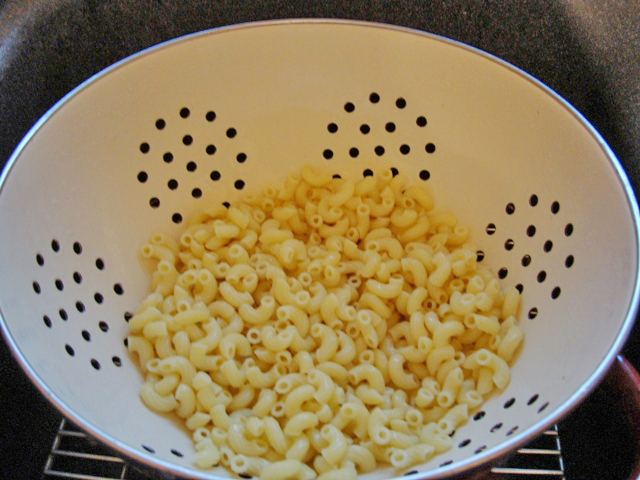 I boiled the macaroni for about 11 minutes in salted water. In a separate pan, I hard boiled the eggs. In case you didn’t already know, adding about ¼ tsp of baking soda into the water before you begin boiling the eggs will help the shells will peel off easily. It’s one of those amazing Pinterest tips that I’ve tried! While waiting for the macaroni and eggs to boil, I grated the carrots and chopped the celery into small pieces. I saved some of the green leaves from the top of the celery to add as a garnish to the salad at the end. When the eggs were done hard boiling, I ran them under some cold water to cool them off. I cut three of the eggs into small chunks and saved the fourth to slice and add to the top of the salad. All four can be chopped into the salad if you’d prefer. 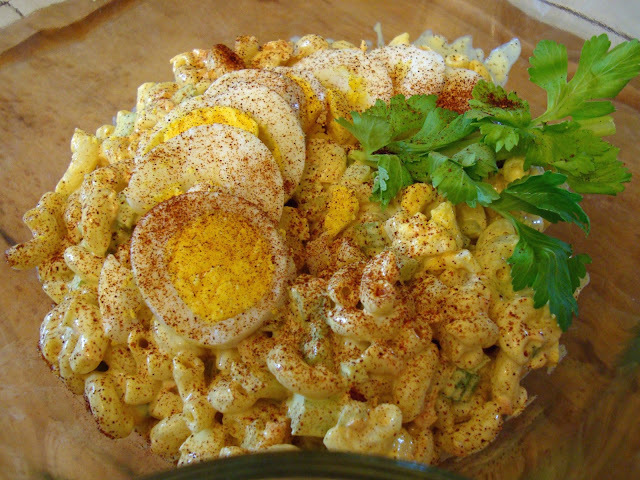 I added the cooked (and cooled) macaroni, mayonnaise, mustard, celery salt, garlic salt, and onion salt to my bowl and mixed them together. I added the eggs at the end and mixed them in gently so that they didn’t get broken apart. 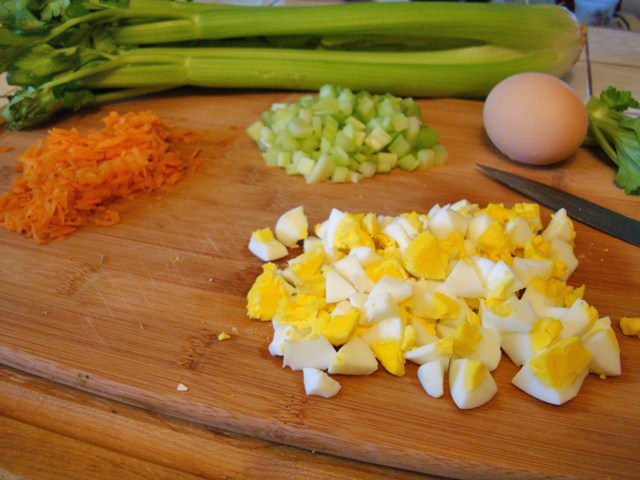 When the salad was mixed, I added the sliced egg and my celery leaf to the top of the salad. Then I sprinkled a little paprika over the top for color. The mustard, mayonnaise and spices can be adjusted based on how creamy or spicy you want your salad to be. The more you make the recipe, the more you will learn to just dump in the ingredients and get the taste that you want. What picnic foods are you making for Monday?